Today in our Tricky Concepts series, we’ll be discussing something many Swedish learners find difficult. 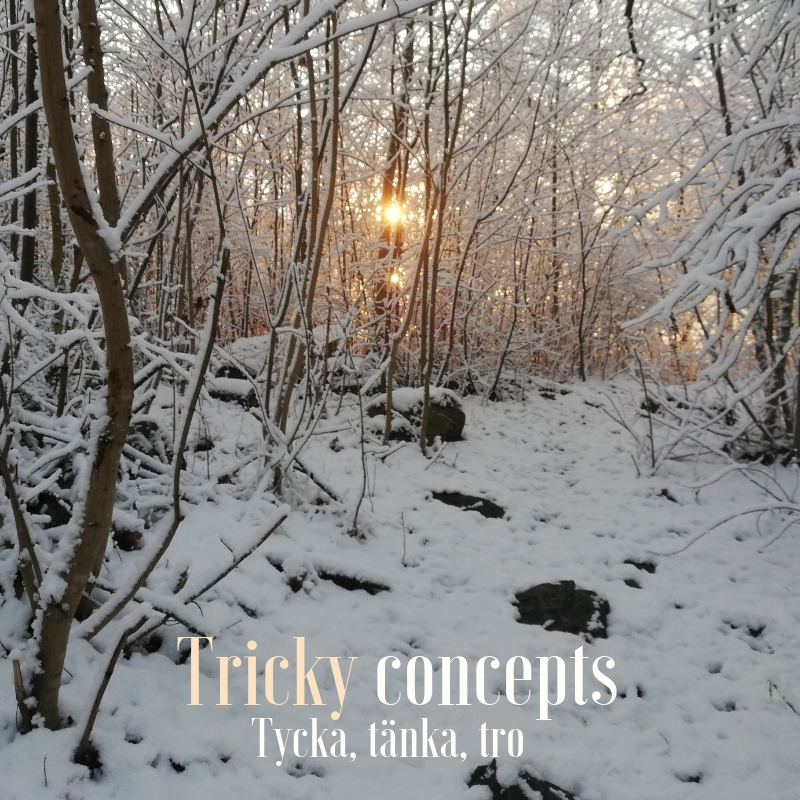 If you find the 3 Swedish verbs tycker, tänker and tror difficult to separate, you are NOT alone. At the end of this post, there is also a free cheat sheet that you can download and use as a reminder. 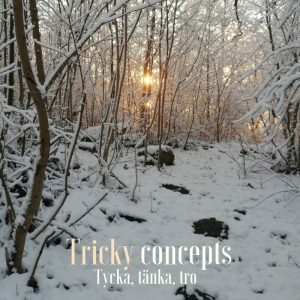 The English word think corresponds to three Swedish verbs: tycka, tänka, and tro, something that likely causes confusion for non-native speakers. It can be tricky because the translation of the verbs can sometimes overlap each other. However, it’s not as complex as it might sound, but takes time and practice to get used to. In this post, we will look at when and how to use these words. Use this verb when you want to express your personal opinion about something. If the preposition om is added, the word then simply refers to the state of liking something. Example: Jag tycker om choklad. I like chocolate. Use this verb when you want to express that you are thinking, or a specific action you intend to take. Example: Tyst! Jag försöker tänka. Quiet! I’m trying to think. Example 2: Jag tänker åka utomlands. I intend to go abroad. Example 3: Jag tänker ta en dush nu. I’m going to take a shower now. Similar to tycka, adding a preposition changes the expression. I’ve used the preposition om here, which then gives tänka a meaning similar to the English word “imagine”. Example: Tänk om vi vinner på lotto. Imagine if we win the lottery. Another preposition you can use is på. In this case it means to think about someone or something. Example: Jag tänker på dig. I’m thinking about you. Tro is related to the English believe, suppose, presume, and guess, depending on context. A hint of opinion is involved, but it’s mainly a belief or a guess in regards to something you are not sure about (or have never experienced). Imagine a scenario in which you are going to the cinema with a friend. You have read reviews, watched the trailers, but you can’t have an opinion about the film until you have watched it. Example: Jag tror filmen är bra. I think the film is good. Once you’ve watched the film, you will have an opinion (and an experience of the film) and therefore use the verb tycker instead. Swedes love to talk about the weather, so you could also think of this verb as the “weather word”, as it’s always used to predict the weather in a conversation. Example 2: Jag tror det blir vackert väder i morgon. I think (believe) the weather will be beautiful tomorrow. Once the next day arrives, you will have an opinion on the weather when you look out the window, and therefore use tycker. The most common preposition to use with tro is på, and is always followed by the object you believe in. Example: Jag tror på dig. I believe in you. Hopefully this has clarified some confusions about how to use these words. But remember to not get too frustrated with them, it takes a little bit of time to get used to the distinction between them. And make sure to download our FREE Tycker-Tror-Tänker Cheat Sheet (button below) and keep somewhere handy, to remind yourself of the difference between these three verbs. This entry was posted in Uncategorized and tagged everyday Swedish, grammar, learn Swedish, learn Swedish online, Speak like a Swede, Swedish beginner, Swedish courses, Swedish intermediate by admin. Bookmark the permalink. Brilliant! I always struggle with these pesky words. In english we just say ‘I think’. Trust the swedes to be all precise and clear in what way they are thinking haha!